Copyright (c) 2013, Natanael Gama (www.ndiscovered.com . info(at)ndiscovered.com), with Reserved Font Name Exo. Exo 2 is a complete redrawing of Exo, a contemporary geometric sans serif typeface that tries to convey a technological/futuristic feeling while keeping an elegant design. 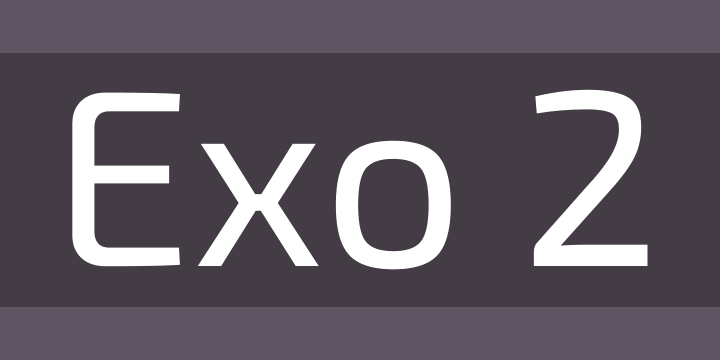 Exo is a very versatile font, so it has 9 weights (the maximum on the web) and each with a true italic version. Exo 2 has a more organic look that will perform much better at small text sizes and in long texts.